With nearly two decades of experience under their belts CapAus was formed. They allied themselves with premiere solar companies in Europe and started manufacturing solar hot water units that would suit and conform to Australian standards. They focused on designing the best and most appropriate systems – and only directly manufacturing those items and components that could not be better sourced elsewhere. Envirosun Roof Mounted System – Water Tank and Solar Collectors (the complete system) Mounted on the Roof. 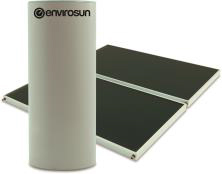 Envirosun Split System – Water Tank on the Ground with Solar Collectors Mounted on the Roof.